Specification of the Patent granted to Stephen Perry, of Woodland's-place, St. John's-wood, in the County of Middlesex, Gentleman, and Thomas Barnabas Daft, of Birmingham, Manufacturer, for Improvements in Springs to be applied to Girths, Belts, and Bandages, and Improvements in the Manufacture of Elastic Bands. —Sealed March 17, 1845. Secondly, our invention consists of improvements in manufacturing elastic bands, when using a certain preparation of india rubber (caoutchouc), applicable for a variety of purposes. And in order that our invention may be fully understood and readily carried into effect, we will proceed to describe the means pursued by us. It is well known that india rubber in its natural state becomes hard with low temperatures, and materially injured by high temperatures; and, further, that if india rubber be held for some time in a distended state, that it becomes set, and loses its elasticity till heat is applied. But within a few years it has been discovered, that by combining india rubber with sulphur, and submitting such combination to high degrees of heat, that the india rubber becomes more permanent in its elastic character, and is not affected to any practical extent by changes of temperature to which this climate is subject. Such preparation of india rubber being now known under the name of “vulcanized india [p.212] rubber,” and sold by the manufacturers, Messrs. Macintosh, of Manchester, such manufacture of india rubber being secured by letters patent, granted to Mr. Thomas Hancock [21 November] 1843: and we mention these circumstances in order to give the best information to the manufacturer, and to state that we make no claim to the preparation of the india rubber herein mentioned, our invention consisting of springs of such preparation of india rubber applied to the articles herein mentioned, and also of the peculiar forms of elastic bands made from such manufacture of india rubber. In making bands, whether for girths, belts, or bandages, with leather or woven fabric, requiring elasticity, the strips of the prepared india rubber herein mentioned may be incorporated in the fabric, or be the means of connecting separate parts of girths, belts, and bandages. The construction of girths, belts, and bandages, being very numerous, though not materially differing from each other 60 far as their requirement for springs or elasticity, it will not be necessary to show every arrangement of belt, girth, or bandage which may have springs applied to them according to our invention, but it will be sufficient to show different means of applying the springs to some classes; and then the person making up other forms of belts or bandages than are shown, will readily apply the springs of the prepared india rubber thereto, according to this part of our invention, which consists of applying such springs to girths, belts, or bandages, made of woven or other fabric, or leather, and not in the form of the girths, belts, or bandages. Fig. 1, shows a girth having at its ends the prepared india rubber strips, a, a, as springs intermediate of the girth and the buckles, the strips of prepared india rubber being securely retained between surfaces of leather by stitching. Fig. 2, shows a belt for the human form; the two ends of the woven portion, c, connected by straps and buckles with springs, a, a, of the prepared india rubber. Fig. 3, shows a knee-cap, or band for the knee of a horse, the parts of the straps, d, d, of which are connected by springs, a, a, as is shown. Fig. 4, shows a band to be applied to the waistband of [p.213] a pair of trousers, or to the back of a waistcoat in such cases; and we prefer to enclose the strips of the prepared india rubber between two surfaces of woven fabric; and we do so by sewing or by cementing the two fabrics together with the strips or springs, a, a, within the ends of the strips, a, a, being fastened (when stretched) to the fabric, as is shown, or otherwise. In like manner bands to form parts of braces, garters, and other articles, are made, having the springs, a, a, incorporated in the bands, or used as connecting means between parts thereof, as shown at figs. 5 and 6. And in this manner may elasticity be given to girths, belts, and bandages made of woven or other fabrics, or leather, notwithstanding they may differ in shape from those shown in the drawing. The second part of our invention consists of manufacturing elastic bands by forming them endless, either in circles or cylinders, or other figure producing an endless band, which are applicable to various uses. Fig. 8, a cylindrical ring; that of fig. 7, is cut out of a sheet of the prepared india rubber, and that at fig. 8, is cut from a tube of the prepared india rubber: these endless springs or elastic bands are suitable for a great variety of purposes, and may be made of any size and strength, according to the purpose to which they are to be applied. They may be covered with leather, silk, or other fabric, and used as garters or wristbands; also for going over other bandages to retain them in their places, in place of using bands of tape, or other such means of fastening; and they will be peculiarly applicable for retaining the paper or other coverings of jars containing preserves, Of other articles; and, in fact, for a great variety of purposes. And we would state, that this part of our invention has for its object the making of endless bands of the prepared india rubber, applicable for various purposes. 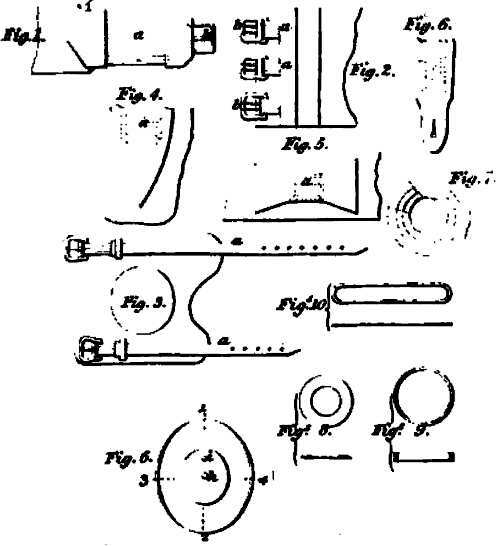 Secondly, we claim the making of endless elastic bands of the preparation of india rubber, applicable to various purposes, by cutting them from sheets or tubular forms of that manufacture.—In witness, &c.
Patent text as given in: Repertory of Patent Inventions and Other Discoveries and Improvements in Arts, Manufactures and Agriculture (1846), Vol 7, 211-214 (source) . Figures from Plate X, The London Journal of Arts, Sciences, and Manufactures, and Repertory of Patent Inventions (1846), Vol. 27, 487 (source) . 17 March - short biography, births, deaths and events on date of Perry's British patent.